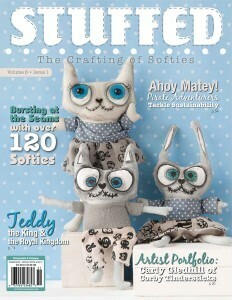 The spring issue of Stuffed is chock-full of eccentric, silly, and spooky softies. The Artist Portfolio features Carly Gledhill of Corby Tindersticks’ softies mixing soft fabrics with design patterns. Pauline Teng Wan Lin, aka zeropumpkin, brings you her Besties Buddies, including Melinda the black widow and Mustard the zombie farm cat, and Teri Drobnick presents her TEEsox whimsical pirates. Discover Rebecca Spinelli’s Monster Veggies, Alexis Fritz’s exquisitely detailed Sea Critters, and Tina Giles’ stuffed campfire scene.